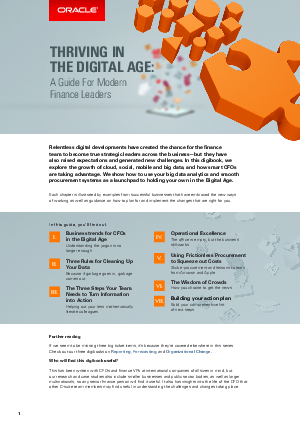 Relentless digital developments have created the chance for the finance team to become true strategic leaders across the business—but they have also raised expectations and generated new challenges. In this digibook, we explore the growth of cloud, social, mobile and big data, and how smart CFOs are taking advantage. We show how to use your big data analytics and smooth procurement systems as a launchpad to holding your own in the Digital Age. Each chapter is illustrated by examples from successful businesses that have embraced the new ways of working as well as guidance on how to plan for and implement the changes that are right for you.